Hawks Hockey ....... Work Ethic, Character, Chemistry ....... Go Hawks! The Hawks were built to serve and enrich children’s lives with the spirit and excitement found in hockey. We strive to develop better hockey players and even better people through the experiences of youth hockey. Our goal is to provide children unparalleled opportunities to succeed at any level while providing the developmental tools for their current and future success. The Hawks are steeped in family values and traditions. We welcome skaters of all abilities, advocate for teamwork and embrace the spirit of competition. 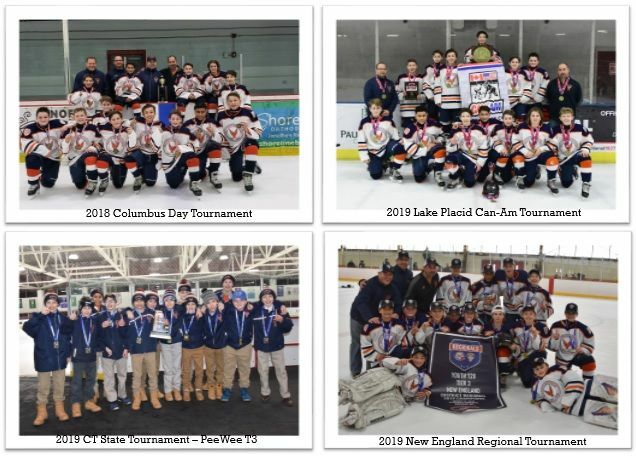 The 2018-2019 Hawks PeeWee A team had one of the best seasons in Hawks history with accomplishments that will be hard to replicate – in any program, at any level. Coach Kaplan was also recognized as the 2018-2019 Hawks Hockey Coach of the Year. A recognition well deserved, but one he was quick to share across his coaching staff. Congratulations on everything you accomplished this past season. Lifetime Hawk and Coach, Scott DeFilio was recognized by GottaLove CT Hockey as their 2019 Hockey Hero. Coach Scott loved hockey and the Hawks, and used his experiences as a player and care for others to help numerous Hawks players develop year to year and learn to love hockey as much as he did. The video they produced in his honor can be found here. Click Here to Make Payments Online! Payments can be made by Cash, Check, or through your WHYHA online account.